These no-bake energy bites are really easy and super delicious. They taste like homemade granola bars and will give you a kick of energy during your afternoon slump. 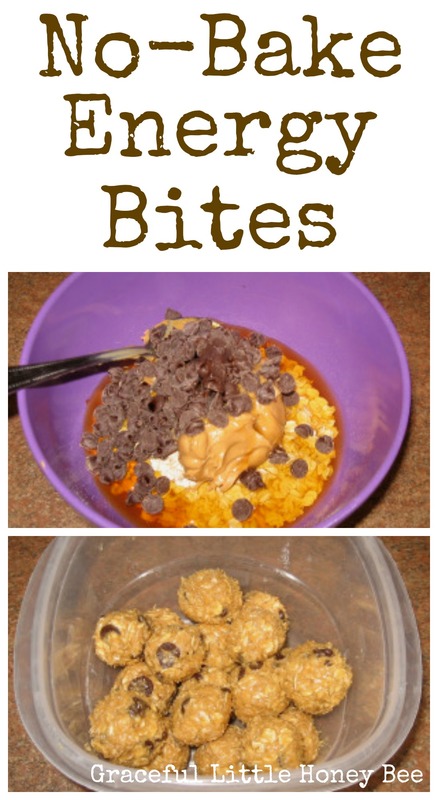 I love to make a batch or two to keep in the fridge for snacks throughout the week. You could add hemp hearts, chopped nuts, dried fruit, etc. to make them healthier and more customized to your tastes. This is a great hands on recipe to get the kids involved, plus they will love eating them once you are done! 2. Roll into bite sized balls. They are good! And they firmed up after being refrigerated a few hours. Ooh YUM! I think I'll have to make these tomorrow :) Thank you for sharing! I saw that first picture in my dashboard, and I was hooked... i am going to have to try making these! Thanks for the adaptation and the source of the original recipe. I am stopping by from the Frugal Friday Link Up Party! I always work long shifts. These will be great for my afternoon snacks. Thanks for sharing. I'm going to substitute almond butter and vegan chocolate chips so that my Grandson can eat these (he's allergic to dairy and peanuts). I'll eat them too of course. how long do these last? Do you store them in the fridge? They don't last long in our house! :) Yes I store them in the fridge. I would say they would be okay for 1-2 weeks. These are SO good. I made these and am totally addicted, but it feels better than being addicted to cake, I guess! haha! I would highly recommend to anyone making them to make the mixture and then refrigerate for about 30 mins, and THEN shape them into balls. I had a hard time shaping them with all the ingredients being room temperature, and they were super sloppy so I wound up reshaping them once they were cooled in the fridge. Next time thats what I plan to do, cool it for some time before shaping. Other than that these were so good, they taste just like a reese's peanut butter cup...the only difference is I don't feel SO much guilt eating one. How many calories per ball, fats, and protein? I don't have this information. I'm sorry.